Our product lines span the range, from CNC machine tending, to gantry and robotic 3D printers, to fully articulated robotic arms for machining, grinding, and work handling. 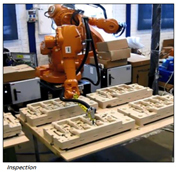 In all cases, these robotic systems allow for the automation of repetitive tasks at reduced labor costs, along with “digital” precision and accuracy. Most of the time, the cycle time per part and defects are reduced as well. We also like to underscore the point that automation can improve safety, employee satisfaction, and sometimes reduce insurance burdens, by taking operators out of traditionally hazardous situations. Recent articles have also highlighted where American workers, with the assistance of robotic operations, have become more cost effective than offshoring – helping bring back production jobs. Force automation is a highly skilled robotics integrator, with a special focus on material removal, machining, and polishing. They have deep experience in metals, as well as past projects with plastics, composites, even pianos. Systems they have built are used in foundries for processing aerospace and commercial castings, turbine blades, electrical components, and more. When necessary, incorporating force feedback and vision allows them to build work cells that have surgical levels of accuracy and repeatability. On the other end of the spectrum, they have built one of the largest robotic assisted cutoff band saws in the US, which reduced the time to degate and deflash a complicated casting from over 4 hours of manual process to 45 minutes – and eliminated all potential for injuries that had happened while working on that casting in the past. Robotic work cells can operate 24/7, without breaks, union disputes, or failed drug tests. They can eliminate employee injuries from repetitive motion, stress, and exposure to hostile environments. Integration of process steps into a single work station [i.e. cutoff, grind, inspection, acceptance, serial marking, polishing, etc.] can save tremendous amounts of floor space and wasted motion. 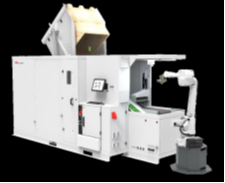 Product can also be passed from one workstation to the other, or into other process systems like CNC machines, welding, paint booths, robotic assembly, etc. All projects are fully customized to the customers’ end requirements. Detailed project planning up front makes Force Automation projects streamlined and cost effective. They also provide excellent support and training after install – they can either support customers with operator training, off-site and on-site programming and support. Click here to view renderings of Force Automation standard engineered work cells. Click here to request more information on their list of support services. New England Foundry Technology is an ABB certified reseller for the ABB FlexInspect product line for the foundry industry. 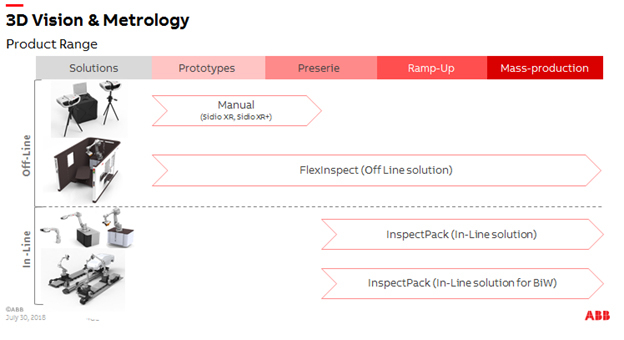 FlexInspect work cells fully automate inspection of serial parts, as well as full data capture on one off components. The accompanying software package streamlines data comparison and reporting. 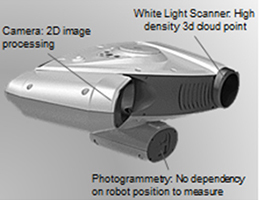 Metrology grade scan accuracy down to 18 um (≺0.001") is possible through a combination 3 cameras integrated on the end of arm tooling – 2D image, Photogrammetry video, and a white light scanner. Scan repeatability down to 20 um allows confident inspection and reverse engineering. 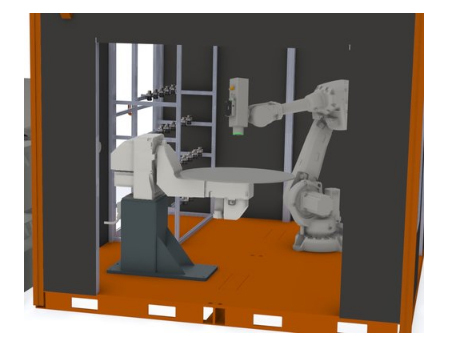 The combination of a 6 axis robot with 2 axis work holding minimizes the number of times parts need to be handled or repositioned in the scanning process, further increasing accuracy and reducing labor. For larger foundries with high volume, longer run production, the ABB Sand Core Solutions team has provided complete systems for most automotive suppliers that have proven the capability of ABB systems to perform virtually every task imaginable: core handling, dipping, spraying mold wash, removing fins from cores and castings, assembly of mold and core components, including gluing, pasting, etc. 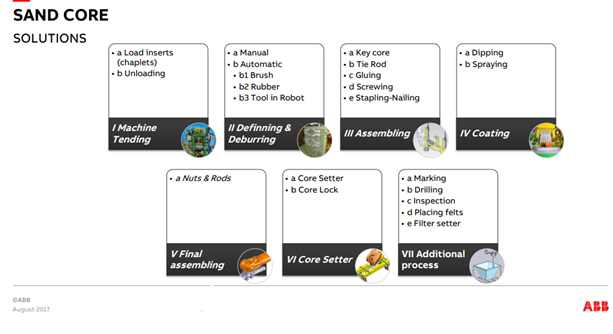 While job shop foundries may not think that they have the volume to justify a large installation, many of these tasks can be effectively automated – by adding up the volume of many smaller cores or molds that need processing on a daily or weekly basis. 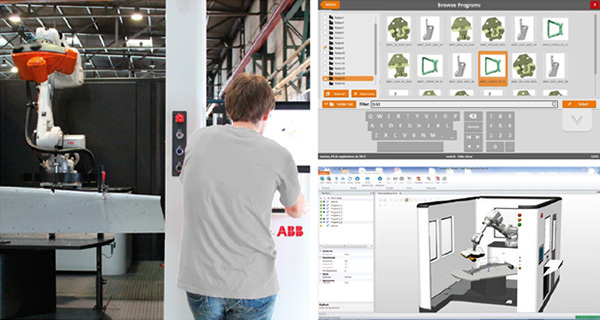 ABB offers a cost effective range of standardized integrated machine tending solutions. Systems are designed to handle parts smaller than 2 inches all the way up to 60 kg / 1 meter wide, with many options available. Parts are moved in and out of the robot system via belts, trays, or bins. Systems typically include the robot, controllers, vision systems, cabinets, and conveyors. 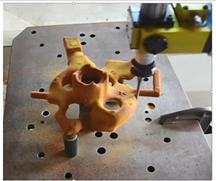 Machine Tending solutions allow production tools like CNC machines, 3D Printers, Scanners, etc. to operate 24/7 without paying a shift differential, or work stoppages due to lunch breaks, vacations, etc. Keep your best employees working on tasks like programming, maintenance, and other less repetitive tasks. EMI-INC supports a prestigious group of historical foundry brands – but they do more than just keep the old systems running. 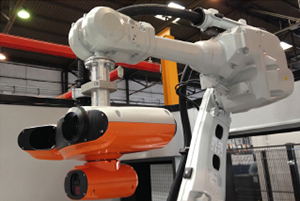 Working with various suppliers of robotics hardware, EMI has successfully integrated robotic solutions for many core room tasks. Unloading parts from core machines, core fin-removal, dip application of mold-wash, core setting in continuous molding lines, etc. Adding a work cell for these repetitive tasks can provide great productivity enhancements to older equipment. 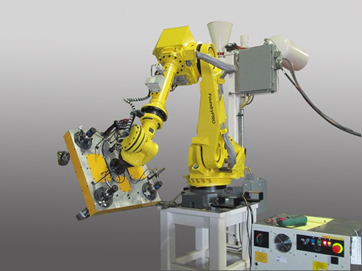 End effectors and programs can be provided to match various tooling / cores, so anything that’s being made on Harrison, EMI, Hunter, DISA or other brand continuous molding lines can be supported, even with a higher production mix than you might think possible.